Season individual pieces of barramundi on both sides with salt and pepper.Dust the skin with plain flour. Sear the barramundi pieces skin down in a large fry pan at medium heat until it crisps and browns on each side. 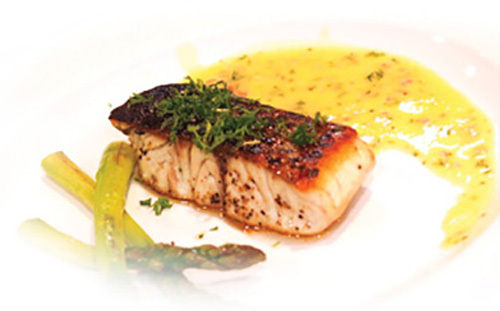 Finish cooking the barramundi pieces in the oven at 180° for approximately 5-8 minutes, depending on thickness. For the beurre blanc sauce, cookshallots in the white wine in a wok or frypan at medium-high until it is reduced by half. Reduce heat to low. At low heat, add butter cubes to shallot mixture one at a time and whisk until sauce thickens. Maintain heat below 58°. Add in lemon juice, salt and pepper to taste. Just before serving, mix in chopped dill. Blanch asparagus in boiling water for approximately 2 minutes, remove and chill in ice water. 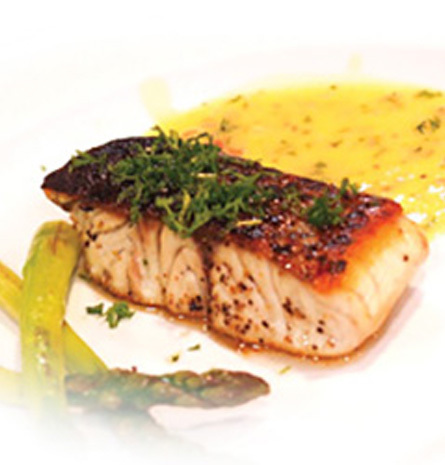 To serve, place barramundi on warm plates and drizzle with lemon beurre blanc sauce. Add several stalks of asparagus to each plate.